Most of the complaints receiving daily from mobile services Customers about unknowingly value added services are activated on their mobile accounts and deducting amount daily/weekly/monthly without their knowledge. Customer can easily deactivate all those VAS services simply sending SMS from mobile. Users can also receive a list of all value added services activate on their mobiles by sending a blank SMS to 155223. SMS 'PORT(Mobile Number) to 1900 from the mobile number you want to migrate. Give a filled application from at the nearest BSNL CSC/Franchisee/Retail outlet along with the UPC code. 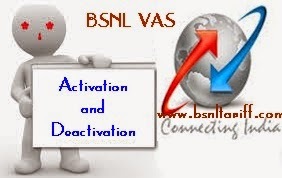 You will be migrated to BSNL within 5 to 6 days if there are no pending dues/issues with your existing operator. Confirmation: For confirmation SMS 'CONF(space)Mobile Number' to 53734. After sending SMS You will get a link to download the mobile TV app. Download and install the app and enjoy.